I love plants. Since childhood I have been a gardener. As a young adult I earned a degree in forest technology. I enjoy identifying species based on their physical characteristics. There’s something about their patterns, their textures, their colors, their variety, and their vitality that appeals to me. I grew up in Miami, Florida. To this day, subtropical and tropical plants are among my favorites, not only to identify, but to grow and photograph. One day a large philodendron caught my eye. Mostly I’ve seen these in pots, in greenhouses for sale, or in houses or offices as decorations. This one was outside. It was growing in a subtropical garden and allowed to attain a native size—which, as it turned out, was quite tall and wide. The leaves were huge. Each one must have been over two feet long. The detail on each leaf was amazing. 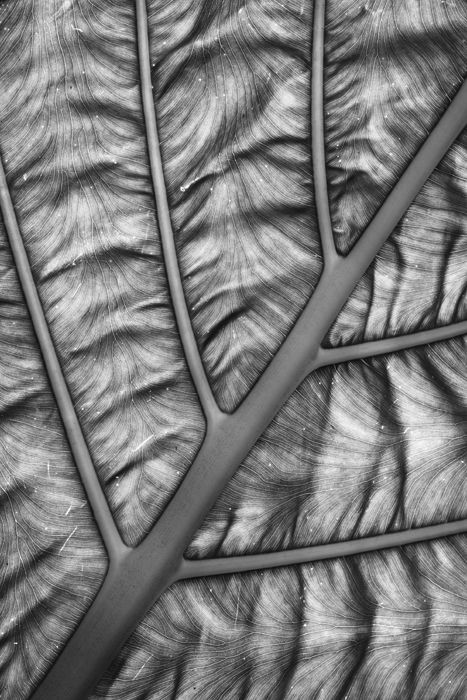 It was rendered all the more visually impressive by the fact that the overhead sun was backlighting the leaf, strongly accentuating every feature. In order to take advantage of the backlighting, I set my tripod up very low—almost to the ground, and shot up through the leaf toward the sun. I later transformed the colored image into black and white because its texture was the most incredible aspect to me. Color was secondary in this case. 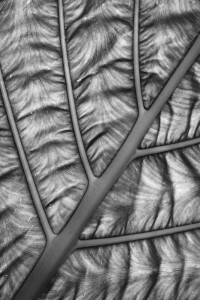 When I look at this abstraction, I know it’s a leaf. But in my imagination I see a landscape. It reminds me of what it looks like to fly over the folded ridges and valleys of the Appalachian Mountains. I chose the title “geogleafy” to reflect both its botanical origins and its geographic qualities. This artwork has to many viewers seemed to be a fine-grained graphite drawing. It expresses a visual delicacy often reserved for artistically rendered writing.